Here’s a crowdfunding project for all you audiophiles. It’s the Wow Wireless bluetooth speaker and it not only sounds great, but looks great, too. Despite the huge number of speakers out there, most of them look a lot alike. They’re generally little cubes or little rectangles made of shiny metal and plastic. It’s not that they’re ugly, but they’re just not very pretty. This little speaker delivers not only great sound, but a genuinely stylish design that will add to your room. 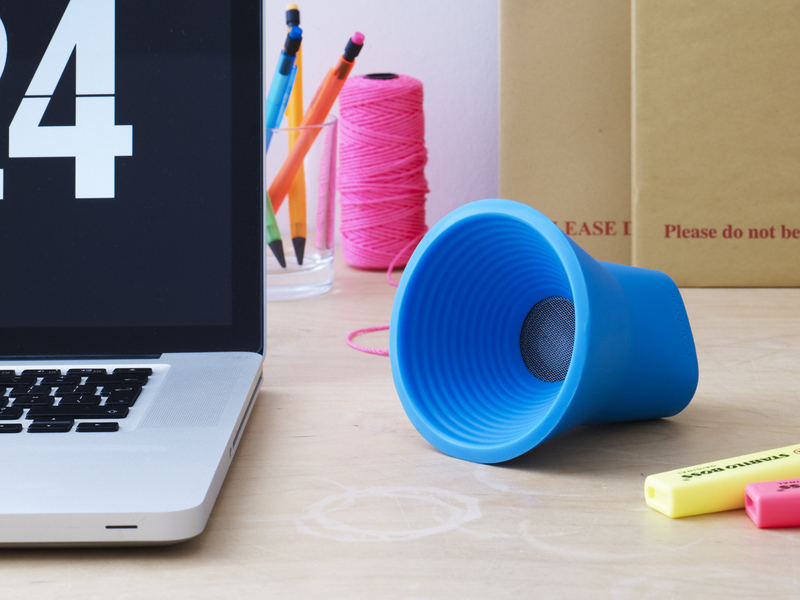 The Wow is a cone-shaped speaker so you can stand it on end for 360 degree sound or lay it flat for more directional sound. It has a thick, silicon exterior that gives it a unique look and comes in bright colors like blue, yellow, and red. It also provides protection to the more sensitive interior components. This is the kind of speaker your kids could knock over without sending you into an panic. It’s stylish and durable enough to take with you wherever you want to go. You charge the speaker with the included micro-USB to USB cable until the power indicator turns from red to blue. This takes about 8 hours for the initial charge. Once the indicator turns blue you simply push the button for it to appear on your device for syncing. That’s it. All sound and track changes are controlled from whatever bluetooth enabled device you choose to sync. The Indiegogo campaign for the Wow speaker is in full swing right now and you can be one of the first to have one on your shelf when they’re shipped around October by making a contribution. Once it’s on sale the speaker will retail for $85 but donors can get one for $55 through the duration of the Indiegogo campaign. I received this speaker for review purposes.